I love these steamed dumplings and the moment I tasted them for the first time at Inorbit in Hyderabad. 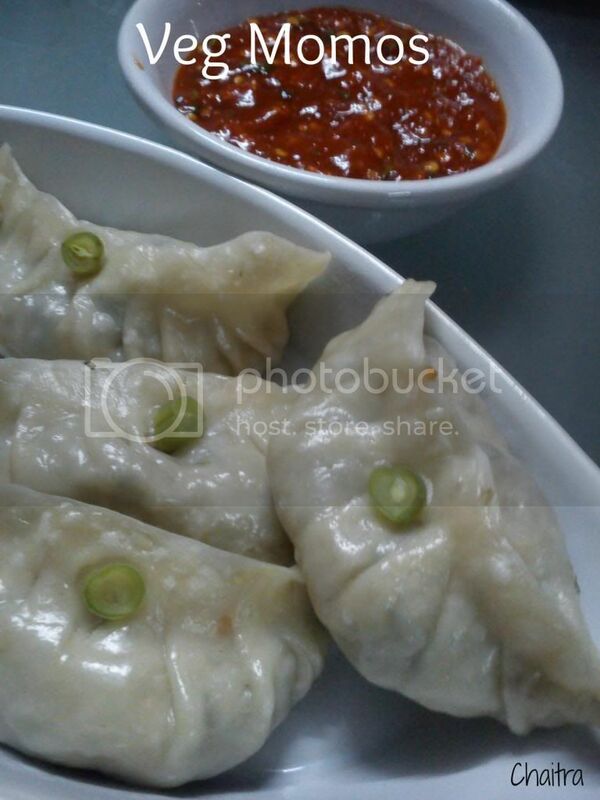 I liked these goeey (if I may call so) and healthy Momos with Tangy and chilly sauce. But none in my house liked it or did they encourage me to order it next time. Thanks to my friends who share roots from North East who kept my taste for momos intact. Preparation is time consuming but the end result with that cute shape is worth it. Lets get onto the road of Momos..
Water- 1/4th cup or less. Onion- 1 small chopped finely. Heat oil in a frying pan and add garlic to it. Fry till the raw smell subsides. Add white part of spring onions and fry for 2 mins.Put your flame on high and add all the veggies to your pan. Toss them on high flame by adding sugar, sauces and the spice powders. Take care not to burn. Finally add the green part of the spring onions and mix all the ingredients well by lowering the flame to medium. Keep this mixture off the flame after 2 mins. Lets go to the momo thing which excites me the most. Take a bowl and add all the ingredients required to make a soft pliable dough with the help of water and 1tsp of oil. It will be just like Chapathi or Poori dough. Keep it aside and let it rest for 10 - 15 mins. Take a small portion of the dough and roll them into circular discs with the help of a rolling pin and ensure that the edges are even and thin. Now take a spoonful mixture of the prepared stuffing and place it in the middle of the circular disc. Drag all the sides to the center and it should like a ball with one side of it opened. You need to fold the edges into Momo shape. You can check out the video here. Somehow I couldn't get the shape and the first 2 momos just went haywire, so I made them into gujiya shape. Brush momos with Olive oil. For steaming you can idli stand or a steamer. If you are using steamer, follow the instructions as you do for steaming and steam it for about 6-7 mins. If you are using Pressure cooker like me, you can take Idli stand and apply olive oil to the idli mould. 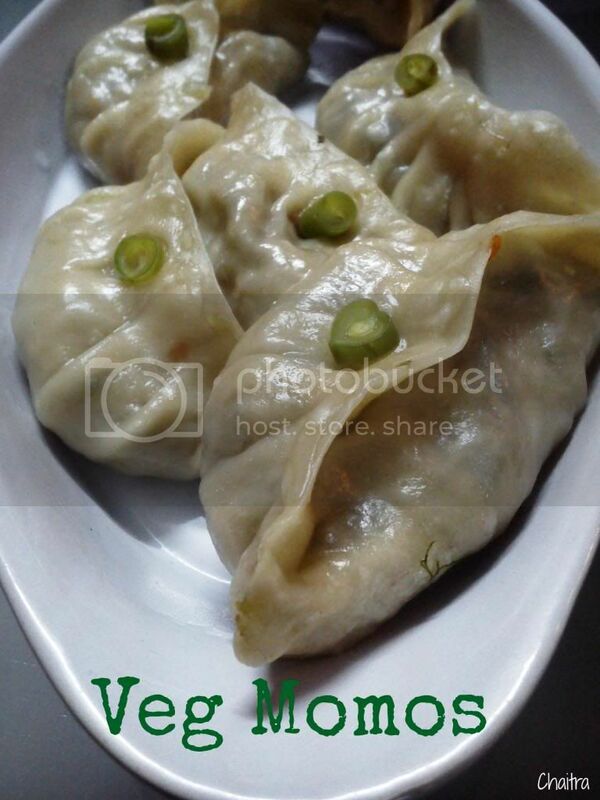 Place the momos. Before placing the idli stand, add 1 inch water to the pressure cooker. Cover the cooker with a lid and steam it without whistle for 6-8 mins. This steaming will vary from cooker to cooker. You can check in between to see if it is done. I bought this sweet and spicy momo sauce from a local vendor. If you are in Hyderabad, you can get it in all Ratnadeep Supermarkets. Bad lighting gave me a run. I prepared during later part of evening and my Miro couldn't capture well. Will post nice ones soon. This post was long pending on my to do list. I was little occupied with things and coming to the blog posts, I was posting all the drafts by scheduling them and couldn't keep in pace. Here we go with the winners. I used Randomizer to help me choose the winners. I love your blog designing and neatly presented pics. You have an awesome store of recipes and would love to try your experiments. 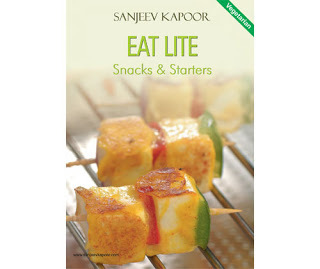 Updating blog regularly is something that I admire in you and would want to learn from you..
You get Sanjeev Kapoor's Eat Lite Snacks and Starters and I would recommend this book for the tantalizing array of snacks that you get to us. 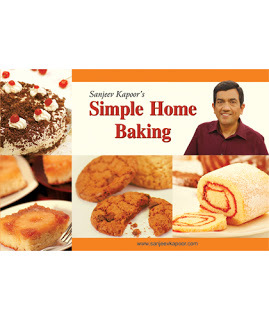 I know your love for baking and chose Simple Home Baking Book by Sanjeev Kapoor.